This image composite shows two of the Mars Exploration Rover Opportunity's magnets, the "capture" magnet (upper portion of left panel) and the "filter" magnet (lower portion of left panel). 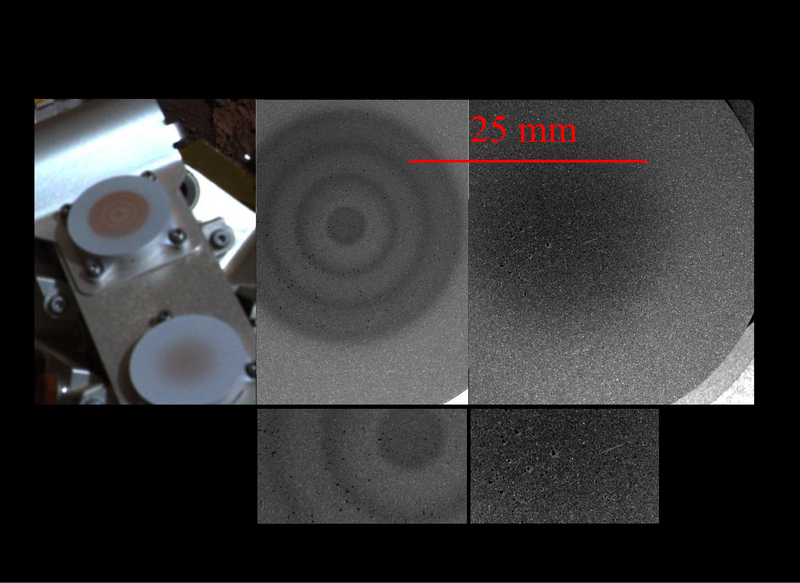 Scientists use these tools to study the origins of martian dust in the atmosphere. The left panel was taken by the rover's panoramic camera. The four panels to the right, taken by the microscopic imager, show close-up views of the two magnets. The bull's-eye appearance of the capture magnet is a result of alternating magnetic fields, which are used to increase overall magnetic force. The filter magnet lacks these alternating fields and consequently produces a weaker magnetic force. This weaker force selectively attracts only strong magnetic particles. Scientists were surprised by the large dark particles on the magnets because airborne particles are smaller in size. They theorize that these spots might be aggregates of small particles that clump together in a magnetic field.